I am authoring several blog entries on my summer 2013 field work in villages that depend on coral reefs in Indonesia. This one covers local reef management, destructive fishing, and how we can look at successful villages and try to copy their success in neighboring villages. This work was funded by the MIT Carroll Wilson grant. Dynamite and cyanide, used by willing fishermen to quickly kill large numbers of reef fish, are alarmingly common fishing methods on the reefs of developing costal states like Indonesia. Dynamite or blast fishing is easy and cheap; bombs are made from readily available materials nearby. Following a blast, scores of fish, stunned or dead, are rapidly collected from the surface. In cyanide fishing, Sodium cyanide and bleach are sprayed onto fish to stun them. Fishermen later fetch large sums of money on the Western saltwater aquarium market and from high-end Asian restaurants. Both cyanide fishing and dynamiting cause extensive damage to corals that take centuries to recover. Many perpetrators live in poverty and are acting on large incentives from reef-loving aquarium owners in the West, or Asian luxury seafood demand. The reef-dependent villages that line the coasts of Northern Bali’s Buleleng Regency (pop. Half a million) are exemplary communities recovering from the bombing and cyanide fishing prevalent through the late 1990s. I spoke with over a hundred stakeholders who view the reef as a key part of their livelihood. These people were located across 5 villages: Anturan, Tukad Mungga, Kalibukbuk, and Pemuteran, and represented a range of stakeholders from boat-makers, to village chiefs, to dive-boat skippers, to fishermen. Pemuteran was a success case, with a vibrant and resurgent reef, and an invested village. The others had pieces of a success story, but were lagging behind in overall conservation efforts. Universally, villagers noted a significant downward trend in the prevalence of destructive methods. They lamented the slow growth of the corals returning millimeter-by-millimeter following dynamite destruction. They were furious that much of the destructive methods were from migrant fisherman with no long-term incentive to conserve that particular village’s reef. So what is the best way to protect the local reef if national park designation is not strong enough? Vigilance from the communities that live within sight-range of the reefs and the corresponding will to act as stewards is a first step. 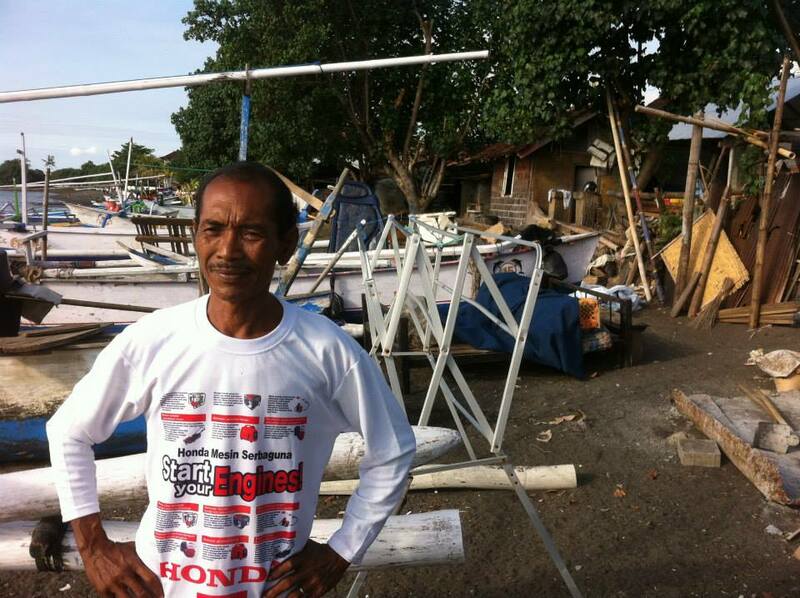 My interviews with the Pecelan Laut, or village-based sea police in the success-case village of Pemuteran, reinforced the idea that local, community-based solutions to destructive fishing are far more effective than bans coming from national government in Jakarta. Practical means to ensure enforce-ability is one reason local management is more effective. As mentioned by many stakeholders, people from other villages or even other countries have the largest incentive come in and blow up their reefs. The Pecelan Laut patrol the reefs further off Pemuteran’s shore several times per week. Their office, directly on the beach, has become a de-facto coffee spot. Men, young and old, from the village can be seen around the clock relaxing, smoking, and enjoying coffee all the while keeping an eye on what they see as their reef. Next to the Pecelan office is a small but effective library for information on the village and their reefs. It is also a spot where tourists can donate to ongoing conservation efforts. The Pecelan are all volunteers, but they must apply for the job, and there is a universal perception of the eliteness of the position throughout the village. The success of the Pecelan Laut in Pemuteran can and must spread through Indonesia and other reef-rich countries. The majority of respondents attributed the “culture of conservation” reinforced by the Pecelan as a product of sustained investment and slow growth of tourism bit by bit. Many sited socially-environmentally conscious resort owners as a major reason for success. One resort owner laughed as he told me the local reef is coming back, and the villagers are invested in protection, simply because Lonely Planet Tour Guides kept their village’s name out of their book long enough for them to put strong conservation institutions in place—and they liked it that way. He likened the fast-paced growth that characterized the other villages in my study to a death blow, bringing in too many people without time early on to organize a plan for conservation. Strong institutions (systems of rules and enforcement) at the local level are not cheap and they don’t come easy—furthermore they must come from the community. Many stakeholders in the other villages that have not seen Pemuteran’s success noted the common government educational outreach programs. They lamented that the outreach was not sustained in a way that resulted in village-wide buy-in to act as reef stewards. I concur, and would argue that an education gap is not the problem. In villages without Pecelan Laut (those with struggling reefs) there is widespread knowledge that reefs are valuable as a long-term asset, but the jump from knowledge to practice was not visible. On an early morning boat trip I took with one of the captains in Tukad Mungga, I watched him pick floating trash off the reef where his divers were, and throw it over the other side of the boat. When I asked him why he didn’t bring it back in he laughed and said “we do reef cleanup for that.”The same boat captain told me the day before that he gave his guests a 2 minute talk before all trips to the reef explaining what they can and cannot do for conservation’s sake. This was notably absent as well. This is not to blame the villagers for overuse and accompanying degradation. Most of the demand for reef use is Western, and on countless trips to the reefs I saw European tourists (who should know better) touching marine life and removing it to the surface. What is to be done? Since groups like Conservation International are siting the area of North Bali as a future marine protected area (MPA) it is my hope this will bring financial support for continued action in villages with it. Something as simple as having a brick and mortar office and a title, gave the young men acting as Pecelan Laut a sense of purpose and pride. This success has potential to spread around Bali since Pecelan is rooted in village and religious culture. Additionally, the gathering point of the beachfront library/Pecelan office is a way to educate tourists about the village’s personal, unique, and dynamic struggle towards reef management. Information kept in spots like these help visitors and locals track a village’s progress in a transparent way, incentivizing tourists to pay a little extra to help the community in its quest. Plus it gives interested locals a place to drink coffee and keep an eye on their reefs. These are all very small and relatively cheap suggestions at enhancing village-based stewardship by looking at a successful case, and trying to re-create the case in neighboring villages.These small centers of reef knowledge and maintenance serve communities by lending legitimacy and pride to the idea of protecting the reef, and could help translate their knowledge on the need for conservation into day to day practice. This entry was posted in Coral Reefs and tagged co-management, coral reefs, Indonesa. Bookmark the permalink. Two things stood out for me on this article. Firstly the main reasons for the destructive methods driven by foreign demand reminded me of the demand in the west for illegal drugs and how poorer countries (the sources) pay the long term price. Coupled with that thought was the Easts demand for the taste of endangered species. The other thing it lead me to think about was just how ‘global’ these issues are. Mankind has to buy into a solution, not just east or west or rich or poor, those distant or those local. The challenge is to find a solution that melds culture and consciousness, needs and demands. Not a quick or ready fix. Nice read Kelly look forward to more. I think people like you are at the nexus point to the solution.